InfoShield Security, LLC is strategically positioned to provide our clients with immediate, on-site destruction of confidential documentation. Our ultra-high security standards and practices provide the utmost in identity protection for our customers and their clients. Everyday, InfoShield helps protect companies and individuals from the risk of damaging exposure. Improper disposal of information can cost your company’s image and future. 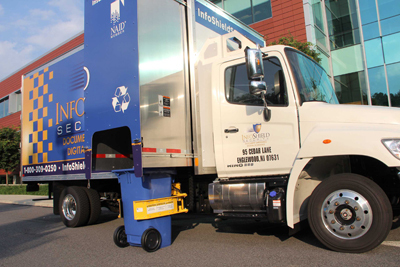 We offer witnessed document destruction via truck video monitors and always provide a Certificate of Destruction for each and every visit providing the date, time, console number and client signature authorization. Thus, whenever the time occurs to prove regulatory compliance, you will have a detailed chain of custody for the complete data lifecycle. We remain apprised of the latest legislation and technological changes in order to protect our clients with the best methods and innovations. We save our clients time, effort and money in providing a service that is far more efficient and effective for disposal of confidential data. We cater to your needs, not our scheduling. When you partner with InfoShield Security we concentrate on adhering to your requirements and design a plan that is best suited for you. As an organization containing confidential and proprietary client and company data, you are required by law to maintain written policies for information protection procedures, including a written process for the selection of a qualified data destruction vendor. 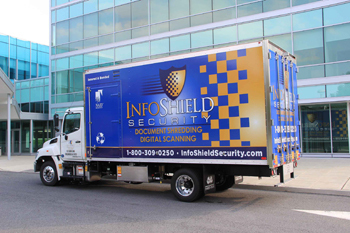 InfoShield Security is licensed in the states of New York and New Jersey as a Document Destruction Contractor and a standing member of NAID, the National Association for Information Destruction. Established in 1994, NAID is a non-profit worldwide trade organization for the secure destruction industry. Its mission is to promote the proper destruction of all forms of discarded sensitive data. NAID is internationally recognized with policymakers and regulators as the primary source for regulation and standards enforcement. Ultimately we all benefit from the strict requirements of NAID certification. We know that our operation is running at its optimal performance and you can rest assure that your information is being handled with the utmost in security. As an InfoShield client, you know that your legal due diligence obligation of selecting a qualified data destruction vendor has been met. We guarantee the highest security practices and adherence to the strictest compliance.